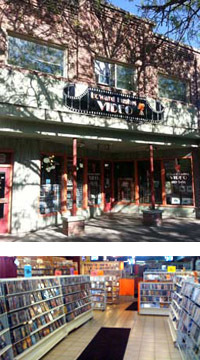 Main Street Video Co-op has been a valuable member of the Moscow community for over twenty years, providing customers with an exclusive and diverse selection of movies available for rental. Howard Hughes Video has always been locally-owned, and reopened under new ownership. Moscow residents Gary Myers, Kelly Moore, and Deb Reynolds purchased Howard Hughes Video in May of 2007. Pat Engle, Neil Franklin, Kelly Moore, and Deb Reynolds are the now owners of Howard Hughes Video and are well-known throughout the community, and strive to support other local business. They are very involved with the operation of the store, and are excited about new ways to engage the community. Due to his enthusiasm for local business, his initiative in purchasing the store, and his persuasiveness in garnering partners in the endeavor, Gary Myers was instrumental in saving Howard Hughes Video. Howard Hughes Video is located at 520 S. Main St., across from Mikey's Gyros and three doors down from the Kenworthy Theater. Howard Hughes Video has a very knowledgeable staff, and is dedicated to its customers. The store offers the lowest prices on rentals, and is proud of the diverse 30,000+ movie titles which include DVD, Bluray, and rare VHS. Customers can find anything from New Releases to Classics and all those obscure titles in-between. Howard Hughes Video is one of the few surviving independent video stores in the country and we count on every single rental to keep our doors open. So come in and check out our selection of great movie titles today. Prices and Deals Every day of the week! *Coupon can be found in the "Student Survival Guide" and can be used any day of the week.